17 phyla (Strayer 2006). The true total, including currently undescribed species, may be twice that number. 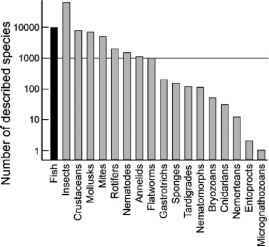 Insects, crustaceans, mollusks, and mites are the most numerous invertebrate groups (Figure 13.1). Numbers of species in some major groups of aquatic insects are Ephe-meroptera, 2,100; Plecoptera, 2,000; Odonata, 5,500; Trichoptera 10,000; Diptera, >20,000; and Coleoptera, at least 6,000 (LeVeque et al. 2005). Protozoans, nematodes, annelids, and many small-bodied taxa likely contain many more species than are presently described, and major geographic regions such as South America, Africa, and Asia are understudied, so this compilation is unquestionably incomplete. 5,000, and tropical Asia 3,000-3,500. All vertebrate classes have freshwater representatives, although dependency on freshwater environments varies, as all amphibians include an aquatic phase and no birds are exclusively aquatic. Approximately 300 new fish species are described or resurrected from synonymy annually (Stiassny 1999), and almost one third of the total known amphibian species have been described in the past decade (Dudgeon et al. 2006). This is evidence that the true totals are much higher. 8% of the three best-studied taxa are imperiled and there are perhaps 150,000 freshwater invertebrate species worldwide, then 12,000 freshwater invertebrates are now imperiled or have gone extinct. approximate approach, projected mean future extinction rates are five times higher for freshwater than terrestrial fauna, and the freshwater rates are similar to those projected for tropical rain forest assemblages. Historically, the status of freshwater biodiversity has been assessed from knowledge of a few animal groups, such as fishes, mollusks, and crustaceans, or by focusing on well-known species such as salmon. 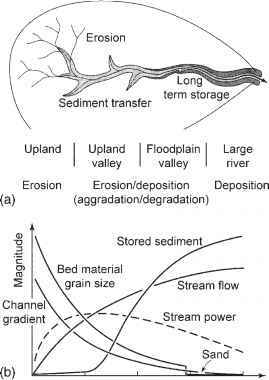 The extent of the endangerment of North American freshwater fishes is well summarized by Williams et al. (1989), who categorize 103 species and subspecies as endangered, 114 as threatened, and 147 as deserving of special concern. This total of 364 taxa represents roughly one out of three species and subspecies of North American fishes. In Canada, 71 of the 205 native freshwater fishes are assessed as being at risk (Dextrase and Mandrak 2006). Some 63% of the 115 native fishes of California are extinct or imperiled, including eight species that are extinct within the state and 15 that have state or federal recognition as in danger of extinction (Moyle 1995). Most declines have multiple causes, but water projects, invasive species, and habitat degradation are thought to be most important. Because 60% of California's native fishes are endemic to the state (and 80% to the region), this loss of California's fish species is potentially of global significance. Although knowledge of the status of freshwater fishes from different regions of the world is uneven, there is ample evidence of widespread imperilment. Moyle and Leidy (1996) estimate that some 20% of the world's freshwater fishes are imperiled or already extinct, and that estimate may be low due to undetected extinctions (Stiassny 2002). Imperilment unquestionably is greater in some areas than others, such as the historically rich, endemic ichthyofauna of Madagascar, clearly in decline on an island undergoing massive deforestation (Stiassny 1999). The nonmarine mollusks of the world are members of a highly diverse phylum that includes an estimated 7,000 described and 3,000-10,000 undescribed species occurring in freshwater. Worldwide, 708 freshwater species appear on the 2002 IUCN Red List of Threatened Species (Lydeard et al. 2004). The North American molluscan fauna, and particularly that of the southeastern United States, is globally rich with an exceedingly high diversity of snails (family Pleuroceridae) and mussels and clams (family Unionidae). This fauna now faces a catastrophic level of extinction. Approximately two thirds of the nearly 300 unionid species of North America are classified as extinct, imperiled, or vulnerable by the Natural Heritage Network, and 37 US species are presumed or possibly extinct (Master et al. 2000). 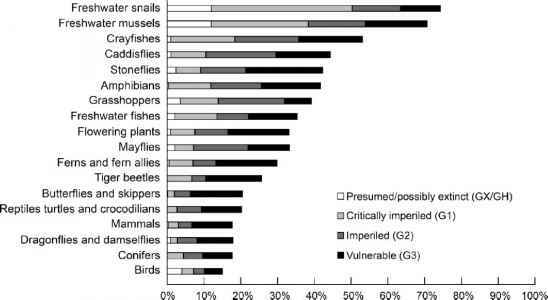 In the Mobile Basin of the southeastern United States, in what was once the most diverse molluscan fauna in the world, one third of the species have disappeared due to habitat and flow alteration (Table 13.1). North America harbors the greatest diversity of crayfish worldwide, with 308 species and 30 subspecies for a total of 338 recognized taxa (Taylor et al. 1996). Crayfishes can be strong interactors in aquatic ecosystems, consume substantial quantities of vegetation and leaf litter, and are a critical food resource for popular sport fishes such as bass. Both wild and cultured populations are an economically important food resource, and are also harvested as bait for recreational fisheries. Although only two species are considered likely to be extinct and formal listings under the Endangered Species Act are few, nearly half of the North American crayfishes merit some level of conservation protection (Taylor et al 1996). The restricted range of a number of species combined with habitat degradation and species invasions are primary causes. The latter includes North American species that aggressively displace indigenous species and are greatly expanding their ranges, such as the rusty crayfish Orconectes rusticus.